NOTE: You must use the Thunderbolt 3 port that is NOT the power port. The one marked with the lightning bolt. Power delivery will still work in this port! 7. Plug Aorus Gaming Box 1070 in. It is hot pluggable. If it doesn't detect in Device Manager, try restarting laptop with device plugged in. 10. Apply AORUS_N1070IXEB_8GD_VER10H2D.bin using FwUpdateTool.exe - it's a self explanatory FW updater. Just make sure you select Gigabyte device. You must use the 16.2.55.275 thunderbolt driver because the newer version doesn't work. 13. You should be good to go. You can re-enable driver device updating from earlier steps if you want, but do not recommend because microsoft auto updates for drivers is terrible. Good laptop. Much smaller than my P50 but it does get a bit hotter than it ever did. Surprisingly even though there's only 2x PCIe lanes, it still benches really well compared to my P50 which apparently had x4 lanes. I think the laptop gets quite a bit hotter since the form factor. I will probably repaste sometime in the next month. For the direct differences from p50(4x PCIe lanes ) to t480s(2x PCIe lanes), the cuda-z tells the host-to-device and device-to-host memory transferring are much slower, while the device-to-device is almost the same and so do the float/int calculation. It makes perfect sense to me, since the bandwidth is the major difference. For the later test, it is simply the combination of these operations and the on-device calculation takes a big portion of the final score. The test also indicates the CPU on t480s is sufficient for the external gpu, at least for the tests your run. Good new for me who ordered a t480s a week ago. Yup. I think this definitely lines up with another thread on these forums about how the x2 pcie lane when going to an external monitor is barely going to impact you. I have no doubt that trying to go to my internal monitor will prove to be much worse. 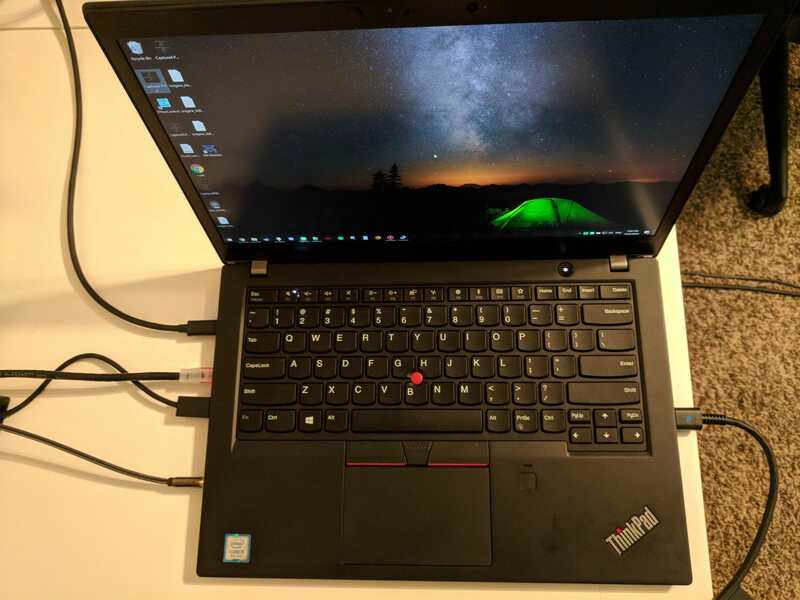 I may try this, but the P50 is pretty much decomm'd as I pulled the SSD from it and when I put it into the T480s it wiped the old drivers and installed the new ones from Windows Update. Don't really want to go through that two more times. I also agree the T480s is sufficient for the gaming I do. I actually completely disabled turboboost so the CPU can only hit 1.6GHz on all cores. Surprisingly I massively reduced my heat, and I can still play my favorite game, Eleven: Table Tennis VR, perfectly fine at 90FPS. I will be repasting the CPU sometime next week once I get my paste. Some more info for you since you might be curious- thermal cap after I applied latest BIOS was 97c. 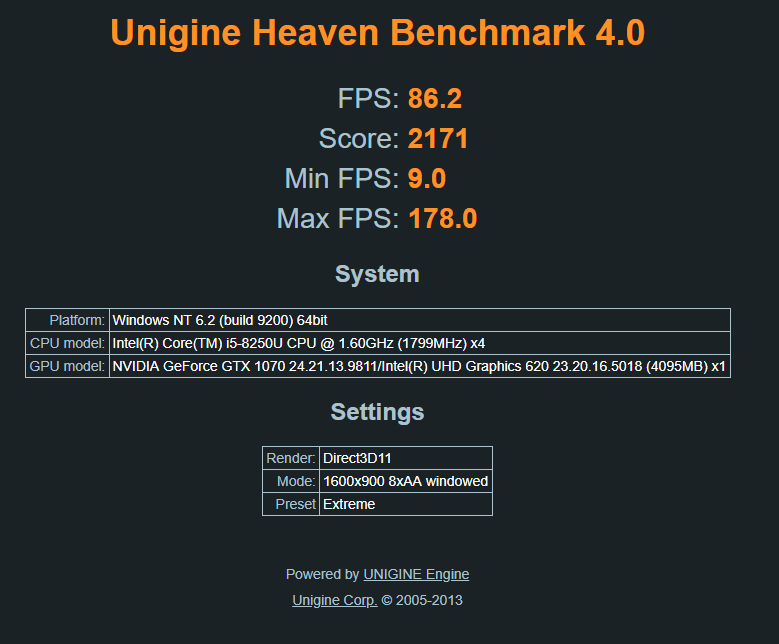 After it hits that, cores stick at around 2.7~2.9GHz after about 20 seconds of benching. Meanwhile stressing the CPU with turbo disabled left the CPU at around upper 60's. Interestingly, when Turbo is disabled, you're looking at a 9W pull from the CPU. Enabled, it's sitting at around 30W. 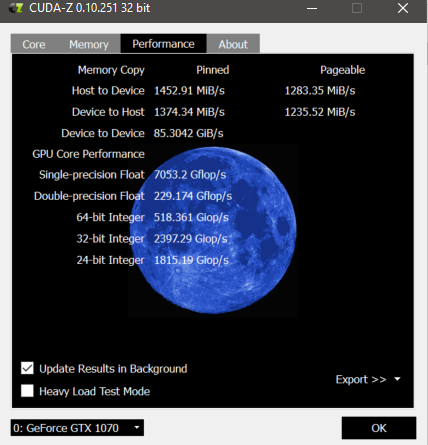 The cinebench r15 multicore was about 332cb. Very efficient by Intel, IMO. Are you getting the T480s with the MX150? I would like to hear about how it goes for you in regards to thermals. I've heard the T480s chassis and heatsink/cpu cooler is the same on both models, so getting it without the T480s gives you a slight boost in thermals. Yes, I ordered the T480s with MX150. UPS is the carrier so you know it's still on the way. I also own a W540, a heavy workstation with a bad reputation on its heating. So I guess I will be pretty tolerant about the upcoming T480s. But I'll let you know how it feels when it's arrived. 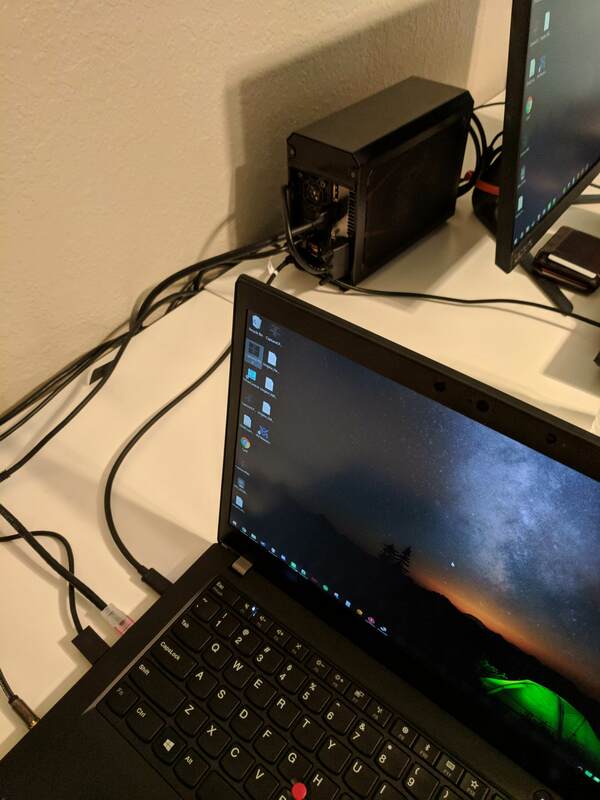 Beside, have you try the eGPU under a Linux system? Since I'm more interested in the computation with GPU (the cuda stuff) rather than gaming, it would be real helpful to work with the external GPU under a Linux environment. No Linux on my side unfortunately. I'm a bit stressed on space as it is with my 512GB SSD. May try it sometime after September (traveling and need to be stable) when I reinstall Windows for a cleaner install. I ended up trying Ubuntu 18.04 and 18.10 and it seems to work fine but hotplugging does not seem to be supported and the drivers are a pain, but it does work. I tried Arch Linux (archlabs variant) and it also worked fine. There was a lot of setup and this was a month ago so I don't feel like documenting but just wanted to share it does seem to work and it gets better the newer the kernel. Hey, no intention of hijacking your thread. But I find this interesting, I own a similar machine. 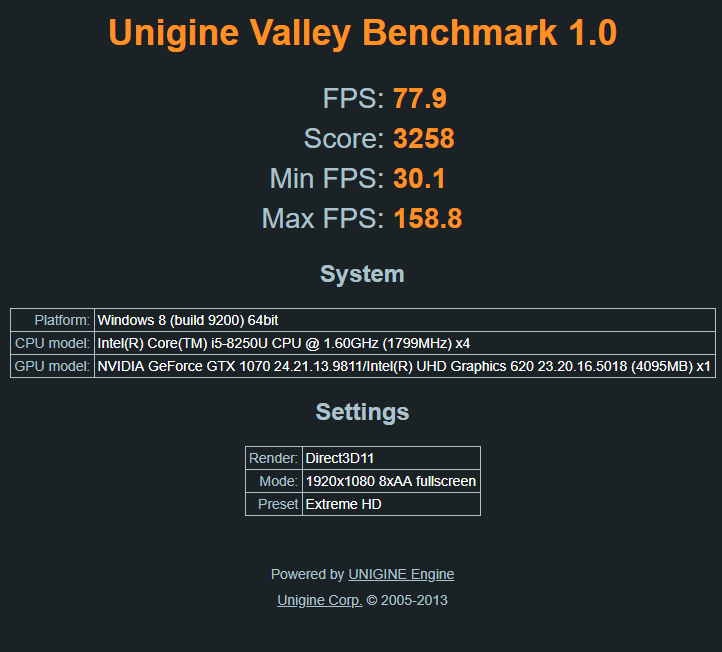 The Lenovo 720s 14", and ran Valley bench with my Auros Gaming Box 1070. And you beat my FPS by a whopping 53% (I got 59.8 fps). 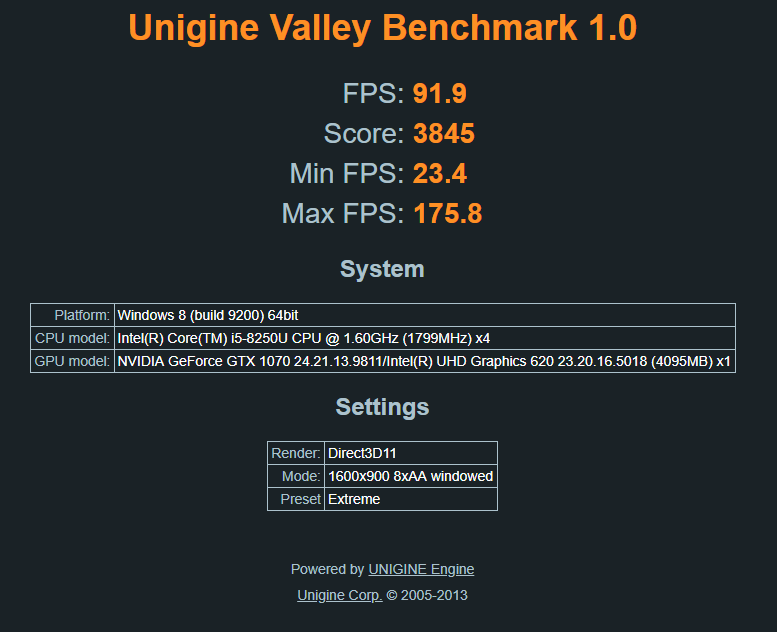 I have almost identical specs, running on a 1080p monitor. Got the newest gpu and tb drivers, as well as the same firmware for the gaming box as you linked to above. Card runs at 67C maximum, 1746 MHz cpu boost with 8008 MHz on the memory. Something is def. wrong. 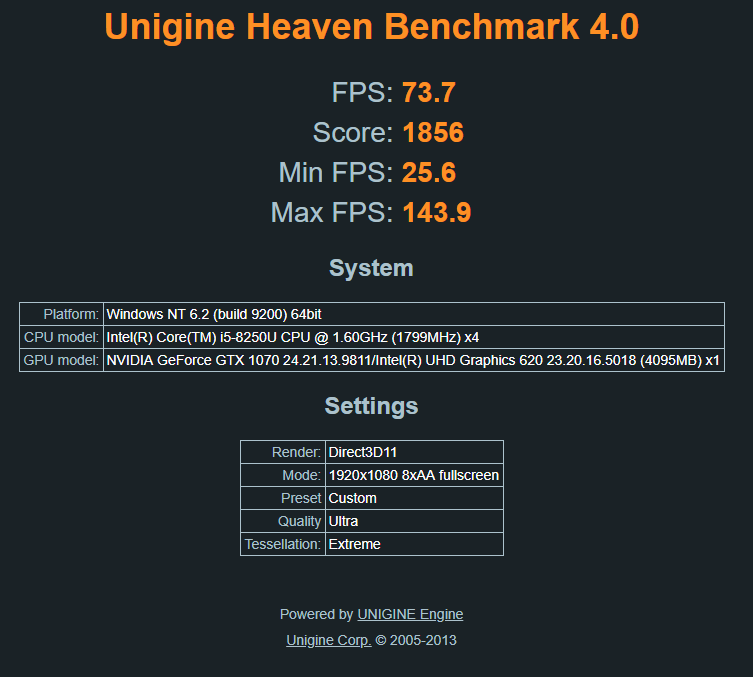 My CPU is significantly weaker in score compared to yours, even tho its the exact same CPU. Silicone lottery? Might be my CPU that's bottlenecking the GPU? I'll try re-applying thermal paste when I get back home next week. All ideas are welcome, cheers.